In this page you need to specify what you want to do with the query. Check Send query Result to an Email Address, if you want to format and send result(s) returned from query(s) to email address(s). 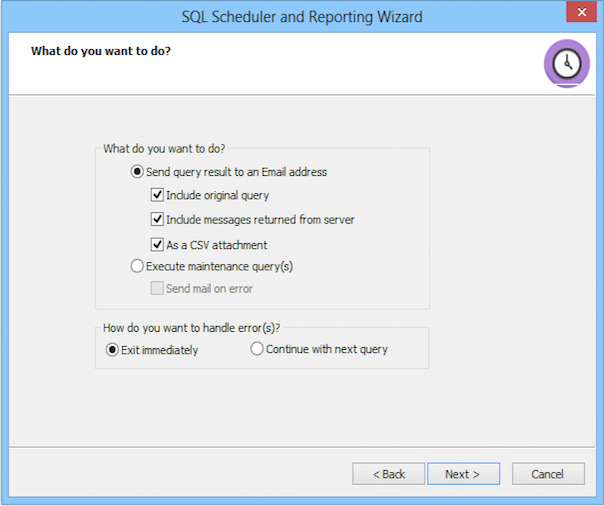 If you want to include the query and any messages returned from the server then check the corresponding options. If you want to send the query results as a CSV file attachment. Check Execute Maintenance Query(s) if you just want to execute some maintenance like ANALYZE, REPAIR etc. at scheduled intervals. You can configure SQLyog to send a mail alert if an error occurs while executing a 'maintenance query'. Apart from the above option, there are other two options to handle errors. Check Exit Immediately to exit immediately on the first occurrence of an error. If you want to ignore the error and continue with the next query then select Continue with next query. Click Next… to specify your MySQL Connection Details.